Thank you for your commitment to red Ravine and to your readers. The blog is such a delight. Best wishes for a year filled with joy. Kathy, thank you so much. Happy New Year to you, too. I’m happy for what I’ve learned from 2010, happy to cross the threshold into a brand New Year. Best Wishes! I’m smashing a bottle of champagne on the red Ravine yacht…the one where I see QuoinMonkey solo at the wheel. Looking forward to the ride. I’m jumping on ship with Natalie, ybonesy, the Midwestern Writers Group, Liz, oliverowl, Roshi, James Baldwin, Flannery O, Hope and Lily, and too many others to name. It’s going to be a good ride around the lake. Teri, you make me smile so BIG! I don’t know how I got so lucky, but I have the best writing friends. I can’t tell you how much I appreciate your support moving into 2011. And James, Flannery, and Lily, too! I was perusing my bookshelves today and ran across my James Baldwin books. Some of them were gifts from you. Here’s to the creative process as she takes a Wild Ride into the future! I have been sitting here mesmerized by your mandala with the WP snow flying past. The contrast of your warm colors with what I think of as cold snow (even in the virtual world) keeps grabbing and holding my attention. I love it. I also love Teri’s comment about christening the new red Ravine yacht. Bon voyage, QM. May this part of the journey continue to bring you joy, magic, and wonder-filled adventures. Robin, thank you so much. I added the oranges and yellows to the background last night. My hands were all smeared with pastels and I felt warm in the cold below zero temps in Minnesota. This one reminds me of a snowflake flying close to the Sun, yet still managing to hold her own pattern and shape. She’s a crystal heart. I enjoy doing the mandalas. They comfort me. And I wanted to say thanks for your support of red Ravine over the years. It means a lot. I remember when Roma and I were going out every day in the beginning and searching for other like-minded blogs. We put a lot of energy into it then. And ended up with blog friends who are still around and going strong. Over time, we had a division of labor and she ended up being the one that went out to other blogs much more than I did. But I still did read and check in when I could. I hope to find a rhythm with that again. I really need to do some soul searching about how keep things going solo. I know you know how much work it is. So far, it’s still worth it to me. But I can’t put the kind of time into it I did 5 years ago. I have to find a different way to make it work. We’ll see what happens. I really appreciate your support and belief in me. Thank you! QM, a mandala to launch the new year on red Ravine. What a good way to start. Sailing, sailing over the ocean waves on the red Ravine ship. Bob, thank you! Happy New Year. Hope it went well on your travels. Here’s to a prosperous and prolific 2011. Happy new year, Captain! 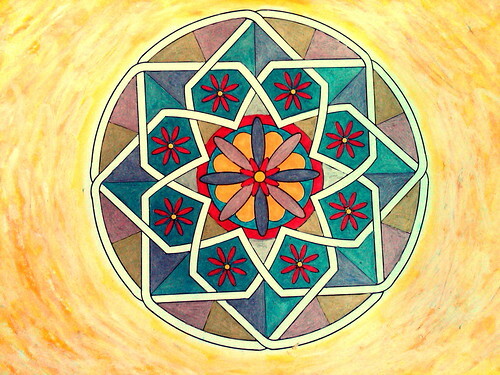 8) I love this mandala, the brighter orange and the way it contrasts with the light pink-purples and blue-greens. Reminds me of your color wheel post. Also I love the faded feel, soothing. Happy New Year, Roma! Winding down tonight. Off to do my Journal Entry in a few seconds. The Captain of this ship may be a Ghost for a time! Will have to find my ground. And follow the North Star. Land, Ho! Hope your New Year’s weekend is going well. It’s COLD in Minnesota. We stayed inside all day. Will check in with you in a few days for those loose ends. Happy 2011.
oops! I was in the loo while Teri was christening the yacht, but be assured that I am on board the SS red Ravine, sailing into the future with you and all the creative souls here. There’s no better captain than you, QM. I’m in no hurry, so take your time in creating a navigating style and pace which suits you. It is a joy and a blessing to travel with you. Happy New Year, QM, and so many blessings to you for 2011. Wow. A lot can happen when you go unplugged from the world for a few weeks. I just returned from a backcountry ski trip in British Columbia (15- 20 degrees below !!! ) and I am finding this news about Roma’s departure. I am still new to this blogging community, but somehow I do feel a little sad about the change. You have both done such beautiful collaborative work together and this will surely be missed by all. And yet, all of these letting go experiences are necessary discliplines for life, especially for creativity, for things to evolve and grow. Happy New Year to everyone and may we all be inspired to let go of what needs to be set free and to be receptive to fresh beginnings, new ideas, friends, seasons. So glad you found us, annieoakcake. And to have found us through Marija Gimbutas, even better. It reminded me of the research I did when I ran across her work in the February Mandalas of The Great Round on BLISS (LINK). It’s fun to look back! ybonesy really is a “real one.” She puts herself out there, doesn’t pull any punches. I will miss her terribly on red Ravine. Especially her fire and sense of humor. I still write with her every week and will continue to be in touch. I hope you’ll go back and explore some of her other posts on red Ravine. She put a lot of herself into them. You can also always see her artwork at her Etsy store. Her art is exploding and I know she’ll keep adding to her work over the year. Thanks for stopping by! Teresa, I’m so happy you stopped in. I was looking back over Guests posts last night and thought of you. Wondered how you were doing. How was the BC trip? Sounds amazing. I feel sad about the end of my collaboration with ybonesy on red Ravine as well. But I’ve had a little time to process it and am working to move forward. I’m hopeful she will be appearing as a Guest once in a while and I’ll still be in touch with her through our Writing Practice. It’s strange to think about, but when we did this blog together, we were almost connected at the hip every day. It’s an intimacy that’s hard to explain to people who have not collaborated before or kept a blog up for as long as we have. I think she will always be a part of my creative life. Welcome back! And I’m glad to hear you will keep checking into red Ravine as I try to navigate into the New Year. lol breathepeace, you are funny! I really appreciate your comment and your support. I woke up at 3:30am last night feeling a little overwhelmed and wondering, am I doing the right thing? Of course, there was a lot of the rest of life thrown into that worry. Not just about red Ravine. I’m heartened by the supportive comments about keeping her afloat in 2011. And thanks for permission to take my time; it might be the only way I know! As I’m thinking about it, I am realizing I have to be more strategic about posting, get my practice posts up early in the year, then figure out a way to sustain with shorter posts along the way. Already have one Guest post and a possible second. So that will help, too. Glad you are on the journey! QM, hope you were able to get back to sleep after waking up in the wee hours. I know in my heart that you are doing the right thing. I honestly feel like this blog is just now taking off, that it has so much depth and substance, and it would have been truly sad (and I would have regretted it very much) if it was closing down on account of my leaving. I suppose it’s selfish of me to be thankful that you are carrying it on–but I am thankful. I believe you (and all of us) will reap many rewards from your keeping it going. And thank you for the kind words about my art and in general, QM. 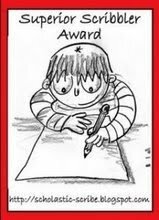 This blog has inspired so many of us to take our writing and art to new levels. It’s powerful stuff when you stop and reflect on it. And nice to meet you, annieoakcake. Will you be opening up a WordPress blog? WP.com has some pluses. It’s amazing to see the explosion of blogs on WP.com. teresa, you have been a kindred spirit out here in bloglandia. I look forward to continuing to see you on red Ravine and watching your blog continue to grow. I’m glad you are continuing the blog! It’s a favorite of mine. I wonder if you and ybonsey could make a book of all your posts together. There’s software for that now. Anyway, I will continue to stop by here for inspiration, motivation, and delight. Christine, thank you so much. I like your idea of making a book from our posts. What’s the software called? I had not heard of it. Will have to research a bit. It’s an exciting prospect. I am glad you will continue to visit. I love the micro poetry you’ve posted on your blog the last few days. Are you planning to do it for a whole year? I’m writing a Journal entry as one of my new practices this year. I hope my short writings have the opportunity to lean to the elegance that your poetry has. You have what it takes, girl! The Courage, strength, humility, heart, intelligence, creativity…and I KNOW you will be successful! And just look at all the friends that are with you and be assured that we are all “there” for you, right where you are, we will carry you on our collective shoulders and never let you down! Hello QM, the ‘February Mandalas of The Great Round on BLISS’ was, in fact, the exact blog my ‘Marija google’ took me 🙂 I’m not an artist or a writer but I felt a certain kinship in the warmth of colour and design of your lovely mandalas. It was probably just coincidence, when I went to your most recent blog, that you had just uploaded ‘New Beginnings: Mandala for a New Year’ (beautifully poignant btw). And it was probably just coincidence, whilst reading it, my husband just happened to mention that our favourite wildlife photographer, Gordon Buchanan, had been filming a 3 part documentary called, ‘The Bear Family and Me’ about a first time mother, Lily and her struggle to raise her cub, Hope (I watched the first part last night on BBC 2 – WONDERFUL!). I found myself comparing them with what you had written about red Ravine… ‘nothing can thrive without nurturing, play, attention and time’. I’m certain that both Hope and red Ravine will do just fine. Hello ybonesy, thank you for your warm welcome. As I was telling QM, I don’t really consider myself a writer. I did start a blog at blogger.com in November, but it was really just to let off steam at some insensitive remarks made by our British prime minister (although, I have to point out, I’m not at all political!). Anyway, it led me to red Ravine in a crazy, round about way… so, I should be grateful 🙂 I’m just going to take my time finding my way around and, hopefully, participate in the writing practices. annieoakcake, thank you so much. And I have to tell you, I can’t believe the coincidence about Lily & Hope! I read your comment to Liz this morning and she told me that the documentary was airing in the UK and lots of people were commenting on it on Lily & Hope’s Facebook page! Liz and I went to Ely, Minnesota last summer for the LilyPad Picnic and the BBC was there doing a few interviews. We will be returning this July for LilyPad 2. Maybe you can cross the pond for it! mama oliverowl, yes! I do remember those lyrics. The group America, I think. Very wise. You are so sweet to write that comment. I am amazed at the support that has poured out from readers of this space that ybonesy and I created together. It’s heartening to know they are sticking with me as I try to go it alone here. Tonight I am tired, but also excited for what is to come. I think things will settle down a bit eventually and I’ll find my groove. You are the best and I send much love. Hi from Kiev, Mr. Stripeypants, and Lizzie! Anyway, back to what I was saying about creative spirits. I was rolling over your BB photo in my mind thinking about how to respond to it (our BB Collaboration) when a couple of days before you emailed me your photo, a mandala has lured me to it. I can’t remember the last time I colored in a mandala, but it has been a while. It made me chuckle to see that you too have completed a mandala for the new year. So, I figured I might as well combine my sunburst mandala with my response to your photo. 🙂 It was an eye-opener finishing this collage! Lotus, thank you. I like your sunburst mandala, a fun response to the Jump-Off photo. I bet you had a great time doing it. Collages are so much fun! I like doing treasure map collages — they always come true for me. So next Monday, you will post the BlackBerry Jump-Off photo on your Flickr account? I’m having a hard time stopping taking my daily BlackBerry photo. I don’t feel the pressure of BlackBerry 365 that I felt last year. So I just snap off a few photos every day still. I may respond to your next BlackBerry Jump-Off with another BlackBerry photo. Will see what the mood is that hits me. I wanted to mention a tip about the BlackBerry 365 — even if you can’t get online and post your photo that day, take it anyway. In fact, take about 5 photos a day if you can. Just snap them off. You can post them later. I found if I didn’t snap the photos when the moment struck, I later regretted it. I’m doing a Journal 365 practice now and actually finding it easier than the BlackBerry 365. You don’t have all the pressure of posting the photos, or the mechanics of taking the photo, uploading, etc. A simple pen and paper. I’m learning a lot. It’s fun! Sorry, I’ve been away a bit, getting through the holidays without our Annie girls has been tough some days, but my girls and husband are a strong bunch. I can’t let them down by being too upset…I just checked in to see your beautiful New Year mandala. You know, my Annie used to draw them! Or color them in. She loved coloring, even at 24. I would buy her books of patterns when I learned how they could be healing. Unfortunately, not strong enough to heal her tortured mind, but I like to think for a short time, she was at peace whenever she worked on one. I, too, am sadded to hear your partner is leaving. If there’s any way I can help, fledgeling that I am, I’d love to try. Take care to Ybonesy, too. (Darn, I was too late to get the own pendant–smiles. My 17-year-old seems very interested inthem. We have good friends in Albuquerque. Don’t forget to look for Annie’s picture in in chapel at Chimayo. Wow, now must get to work learning about all these japanese poems! Ah, Linda. That is such a touching comment. I’m so sorry. I can’t imagine how hard it is to move through different milestones around the loss of Annie. It sounds like you and your family find solace in each other. I hope that Annie did find some peace with the mandalas. Yes, lots of changes on red Ravine. Thank you for your offer and I am happy to see you here. It is sad about ybonesy leaving, but I think we’ve both nearly made our peace with it. Though we are still wrapping up some loose ends from our partnership. Almost done! I’m trying to adjust to running red Ravine solo and haven’t quite caught up yet. I’m working on wrapping up the technical details with ybonesy and finding my own rhythm with posting. I think it may take me through January to hit my stride. I hope the readers bear with me! BTW, you can still visit ybonesy’s online store to purchase her art (the link is on the sidebar). Oh, I meant to mention, I love Chimayo. I’ve visited there a few times when I’ve been in New Mexico, an amazing place. Next time I am there, I will look for Annie’s picture. Wonderful that she is there. A place you can visualize her that may also bring some peace. Thanks for stopping by, Linda. annieoakcake, exciting news! We had dinner with one of our Minnesota Bearhead friends last night and she told us someone had sent her the links to the three BBC episodes of Lily & Hope! We got the email this morning and Liz and I plan to watch the BBC films this weekend (as background for others, posting the link to the post: MN Black Bear Den Cam: Will Lily Have Cubs? (LINK)). Can’t wait to watch! BTW, I did notice that your tanka was inspired by Lily & Hope. That was so great! I can’t believe you’re in Scotland. It’s a place I’ve always wanted to visit. Maybe I will see you there some day. In the meantime, we’ll meet once and a while on red Ravine. Unfortuately, I’m absolutely pants at anything to do with computers… I’m glad someone was able to forward you the link. I just wanted to let you know how your comment to QM deeply moved me. I have a daughter who has just turned 25 and, in my worst nightmare, I couldn’t imagine my life without her – my heart goes out to you for the loss of your Annie. In Scotland, we have what we call a ‘clootie tree’. This is where we tie a ribbon or piece of cloth (clootie) to a sacred tree and say a prayer to enable healing/peace in a friend/relatives life. I will be visiting one at the end of the month and would be honered if you allowed me to tie one for you and your family. annieoakcake, Liz and I still have to watch Part 2 & 3 of The Bear Family & Me. I have to tell you though, we both cried all over again in the documentary during the time when Hope was lost as a cub. I remember it well when it was happening LIVE. Gutwrenching. I guess we have no idea what’s going to happen this year with Lily & Hope sharing a den. But we just watched the Live Lily & Hope DenCam yesterday when they went to clear the lens, and it looks like Lily is pregnant again. It’s going to be an interesting few weeks! Will look you up when I get to Scotland. It may be a few years! Gutwrenching is THE word! Fortunately, I had gathered from red Ravine that wee Hope did, indeed, survive – else I’d have spent the whole time watching from behind the sofa! I won’t give away too much, but I have no doubt that Lily and Hope will change many peoples perceptions of black bears. Hi Linda. Just wanted to say thanks, too, for your kind words. And that I will keep my eye out for your daughter’s picture on my next visit to Chimayo. Thank you all so very much. Oh yes, Annieoakcake–I’d be honored to have a ribbon tied for our Annie. How perfect, too. When she was a baby, she had so little hair (and yet ended up with the most!) I constantly tied ribbons on her little head…so of course, Mickey and Minnie Mouse were her favorite ‘people.’ Her sisters and I wore headbands with bows on them at her service…I think she got a kick out of that. Thank you so much. I just found out that my oldest is expecting a child about the time of Annie’s 26th, or would have been, birthday in September. I guess the circle does continue. I was supposed to go to Samye Ling (where the clootie tree is) at the end of January, but my husband couldn’t manage and we had put it off until this weekend. It’s such a beautiful place.